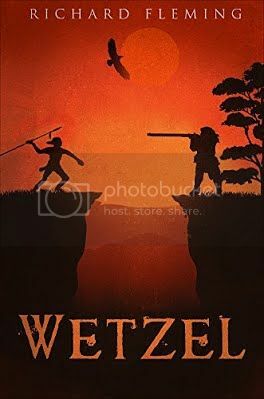 "Who in the west has not heard of Wetzel, the daring borderer, the Boone of North-Western Virginia." Wills de Hass, 1851. Lewis Wetzel came of age near the end of the Revolutionary War and was an important participant in the twenty-year war between the woodland Indian Nations and the settlers of western Pennsylvania, western Virginia, and Kentucky. The novel, although classified as historical fiction, traces Wetzel's life over a period of more than twenty years, featuring events and the rich history that occurred in the upper Ohio River Valley, Kentucky, Ohio, and down the Mississippi to New Orleans. According to de Hass, a historian in the mid-nineteenth century, Wetzel's efforts were without parallel in border warfare. He moved along in the direction indicated by the track he had found, and he soon found another. The Indian was moving along the path parallel to the tree line, which ended at the riverbank. Lewis knew that the Indians often used the islands such as Boggs Island to help them cross the Ohio, and he figured that this warrior was heading directly to the shore opposite the island. He came to a break in the tree line, and he could see the island in the distance. There was tall grass and some light brush in the open area, then another clump of trees. Wetzel dropped to a crawl, keeping his head below the taller grasses until he reached the trees. He looked for some sign of his quarry and eventually saw a broken twig just a few feet to the left of where he had entered. A natural path led along the base of a low-rising hill, and Lewis followed it, stopping often to listen and examine the forest floor to both sides. Something that sounded like singing, a female voice. His eye then caught sight of his prey, kneeling behind a big maple and watching something intently. Wetzel dropped down behind some bushes and stared at the husky brave. What was he looking at? Lewis backed up a bit and shifted to his right where there was a small opening in the trees through which he could see to the riverbank. What he saw nearly took his breath away. A woman Wetzel stood at the edge of the stream, splashing water on herself. She was completely naked, and she was singing softly. Wetzel knew immediately that it was Lydia, and he could not take his eyes off her. When she began to turn, Lewis was so enthralled that he nearly forgot his dusky friend who was sharing this view. Lydia stepped toward the canoe that was pulled up on the bank near where she stood and reached for the towel, slung over its side. In so doing, she exposed her front side to the two men watching her with avid attention. Lewis was conscious of the effects this sight was having on his body. Her breasts were as beautiful as he had imagined, and as his eye dropped down to the dark thatch between her legs, he could scarcely keep himself from crying out. He felt the desire well up within him, and he wanted to rush down and take her in his arms. Lydia casually lifted the towel and began to dry herself, completely unaware of the two men watching her from so nearby. Lewis, remembering finally the danger to Lydia crouching behind the big tree, looked to see what the warrior was doing. eased back into the woods behind him and moved to a position advantageous for an attack. How should he do it without revealing to Lydia that the two of them had been peeping at her. He could not wait much longer, he knew. from his right ear. Wetzel aimed just in front of the dangling gem and squeezed the trigger. The ball slammed into the unsuspecting brave in the right jaw, plowing through his mouth and out just under the left eye. He dropped instantly and without making a sound. Wetzel could hear the scream from Lydia, but he waited for a short while before moving. He was confident that the Indian was dead, but he made no move to go to the body and retrieve the scalp. He could not see Lydia now, but he figured that she was scrambling to get dressed and get the canoe out into the river. Waiting until he thought she was probably dressed, he then pushed through the trees, making as much noise as possible. Lydia was visible as Wetzel neared the edge of the woods, and he could see that she was no longer naked. She had put on the gown, but he could see that her petticoat was still in the canoe. She had crouched down by the side of the canoe that was nearest the river, and as he came into the clearing, she screamed again. “Lyddy, it’s me, Lew Wetzel,” he shouted, hoping to stop her screaming. It had just occurred to him that they might not be alone, even though he had seen no one else. “Who?” Lydia stopped screaming but remained half hidden by the canoe. “Lew Wetzel!” exclaimed Lew, louder this time. Now Lydia stood up and immediately recognized the young hunter. “That wasn’t my intent, Lyddy,” protested Lew. “Was that you shooting?” Lydia demanded, walking around the bow of the canoe and approaching Lew. Her expression had changed from one of fright to one of fury. “I reckon it was,” admitted Wetzel. “I thought you was supposed to be a crack shot,” said Lydia, beginning to calm down. “Suppose to bein’ and bein’ are two different things, mebbe,” said Lew. He had decided it was better not to mention the Indian. Another thought occurred to her, and she felt herself beginning to blush. “When did you first see me?” she asked suddenly. Wetzel stole a glance at the petticoat draped against the side of the canoe. “Maybe you ain’t dressed quite proper even now,” replied Lew, surprised that he would talk that way to a girl. He surely would never say such a thing to Betty Zane. Lydia had seen his glance, and she blushed even more. Still she was feeling a certain excitement at this turn in the conversation. “I sure wish I had seen that!” said Wetzel emphatically. “What difference does that make? Does that mean if it was some other girl, like Betty Zane, you would have watched?” Lydia was not particularly fond of Betty Zane. It was rumored that she was engaged to Moses Shepherd, a young man that Lydia had in mind for herself. Wetzel did as he promised, and Lydia finished dressing. She wanted to stay angry with him, but she supposed she didn’t really have a good reason. The look on his face, though, made her wonder if maybe he had seen more than he was admitting. When she was ready, she called to him and climbed into the canoe. He laid his rifle carefully on the bottom and pushed the little craft out into the water, jumping in as the current began to carry it away from the shore. He took the paddle and began the trip back around Boggs Island and to the shore on the other side. Two days later, Lydia sat in the commandant’s room at Fort Henry when John Linn came in to talk to her father, Captain John Boggs. The two men spoke for a few moments when a remark of Linn’s caught her attention. A puzzled look came across Boggs’ face. “Weren’t you over there a couple days ago, Lyddy?” he asked his daughter. “Lew Wetzel said he’d found you there. Did you hear anything that day?” Boggs had intended to address the matter with his daughter and give her a good scolding, but he hadn’t got around to it yet. “Not a thing,” said Lydia immediately, wondering how much Wetzel had told her father. The men looked at each other and shook their heads. “Let that be a lesson to you, Lyddy. You’d best not go over there again like that,” said Captain Boggs. “I won’t, Pa,” answered Lydia. Some rabbit, she was thinking to herself.